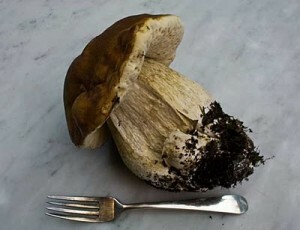 He handed me the mushroom, a king bolete, also known as porcino in Italy and cep in France. I weighed it: 1 pound 10 ounces. When I cut into it, the flesh was firm and pure white, untouched by worm, fly, slug, squirrel, or rot. I’d never seen anything like it. Normally, porcini this big have been heavily predated upon and are chock full of worms. “Where’d you get this?” “Right in front of the house.” “Whataya mean, right in front of the house?” “Let me show you.” Steve brought me to a spot twenty feet from our front door. It’s been raining for weeks, so on went rain coats, rain pants, and waterproof hiking boots. 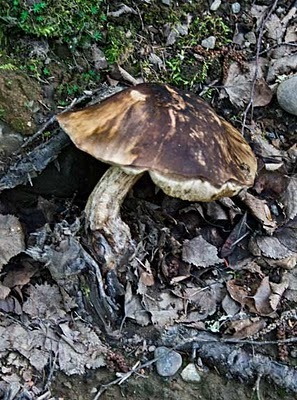 Going mushrooming involves tromping through woods, pushing through understory, going up and down hillsides, seeking out terrain where desirable mushrooms thrive. Staying dry is key to maintaining proper enthusiasm. Gearing up was next. It’s best to harvest into woven baskets, which allow air to circulate around mushrooms as they accumulate. It’s also easier to protect mushrooms from being crushed or broken by carrying them in a basket. If you harvest into plastic buckets or, worse yet, into plastic bags (which you should never use), the combination of moisture, weight, and jostling causes mushrooms on a bucket’s bottom to be bruised and slag down. I dug out an old knife for each of us; mushrooms need to be cleaned immediately after being picked. A good sturdy stick is the final necessary piece of mushrooming equipment. The stick is used for pushing away grasses and underbrush in which mushrooms hide. It’s also very handy for ascending and descending steep slopes in search of a perfect fungus. Raingear on. Baskets, knives, and sticks collected. We jumped in the truck, heading for one of the many expanses of boreal forest that dot the Anchorage landscape. We parked and headed into the woods. Urban sounds faded. We were quickly enveloped by the stillness that isn’t silence of the forest. Water dripped from branches onto wide devil’s club leaves. Wind whispered through birches. Squirrels shrieked and chattered. Our footfalls, initially silent as we meandered down moss-covered paths, echoed when we started bushwhacking through twig-strewn hillsides. When we held still, bird songs from every direction filled our ears. Within minutes, Steve spotted a Boletus edulis. And another, and another, and another. Six in that first location. My vision adjusted to the forest dim; I started finding them too. Our baskets quickly filled with mushrooms: Boletus edulis, Leccinum subglabripes (formerly Boletus subglabripes), Leccinum alaskanum, Leccinum versipelle, and puffballs of all varieties. It’s a banner year for mushrooms. The rain and overcast summer skies that have inspired Anchorage residents to complain loudly and longly (and set a soggy record) are precisely the conditions in which mushrooms thrive. They arrived early and in spades. We collected thirty pounds last weekend and only stopped gathering to give ourselves time to process our collection. Last week’s mushrooms are dried, cooked, and frozen. Fresh boletes are popping up all around the house. It’s time to head out again. The first and most important rule for mushroom foragers is: “When in doubt, throw it out.” Do not gather mushrooms that you can’t absolutely, positively identify. Leave all unknown or questioned mushrooms alone, even if it means walking past many mushrooms of every color and shape before finding one you recognize. 1. The best way to learn about mushrooms is to have someone show you the edible species; spending time studying field guides also helps. The perfect field guide for Alaska doesn’t exist. The books I like best are David Arora’s Mushrooms Demystified and All That the Rain Promises and More: A Hip Pocket Guide to Western Mushrooms. I also like The New Savory Wild Mushroom by Margaret McKenny and Daniel E. Stuntz. Alaska’s Mushrooms: A Practical Guide by Harriette Parker is good, but very limited in scope. I made a decision a long time ago to stay away from most gilled mushrooms. The differences between edible gilled mushrooms and those that are poisonous can be very subtle. 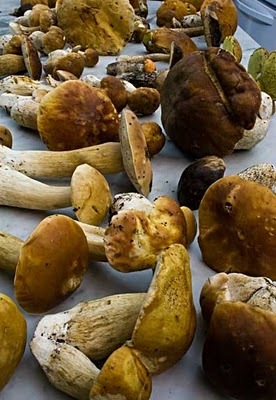 Mushrooms without gills – morels, puffballs, hedgehogs, and boletes – are much easier to identify than gilled mushrooms, and far less likely to be confused with dangerous lookalikes. 2. Search for young firm mushrooms. Their flesh is dense and delicious. More importantly, insects, worms and other competitors are less likely to have reached them. 3. Look very carefully before picking the biggest and most impressive mushrooms to catch your eye. The longer a mushroom is above ground, the more likely it is to be so infested with worms and insects that it’s unsuitable for human food. Be sure, however, to look around the area where you find rotten or infested big mushrooms as you will often spot younger, less developed fruit of the same variety emerging. 4. Gather the entire mushroom, base and all, using your fingers to dig down around the stem and gently free it from the underground mycelium. Especially when gathering boletes, do not cut the stem with a knife. If you cut the stem, leaving part of it in the ground, the thick fleshy stump can rot and kill the mycelium. (Think of mushrooms as apples and the mycelium as the tree; if you kill the mycelium/tree, you won’t get any more mushrooms/fruit in future years.) Fill in the hole left by removing the mushroom with dirt, moss, or leaf mold. 5. Immediately after harvesting a mushroom and before you put it in the basket, use the knife to trim the dirty stem end and any damaged areas. Don’t put mushrooms with loose clumps of dirt in your basket. If you do, dirt from the upper layer of mushrooms gets all over the lower layers, making them harder to clean when you get home. Likewise, if you see worms or other insects in the mushrooms, cut them out immediately; the longer they’re in the mushrooms, the more of your dinner they’ll eat. 6. Wild mushrooms should never be washed in water. Use a soft brush to remove as much dirt as you can from the caps and a damp paper towel to wipe the cap clean. 7. Cut mushrooms in half and inspect for worms or other insects; remove as necessary. Don’t worry about a few worm holes; it’s the worms themselves you want to eliminate. If the pores beneath the cap are soft or soggy, remove them. 8. Store fresh mushrooms in paper bags, never in plastic. In Anchorage, the best way to dry wild mushrooms is in a dehydrator (in other climates, you may be able to air dry them). Clean the mushrooms well and slice them 1/4” thick. If you slice them thinner, the slices stick to dehydrator trays and are impossible to turn. Put the mushroom slices on trays in a single layer. Start running the dehydrator, and turn the slices every couple hours until they’re dry. This helps the mushrooms dry evenly and also prevents them from sticking to trays. Rotate the trays each time you turn the mushroom slices. When the slices are completely dry, let them cool and pack in glass jars with airtight lids. If even a few slices are still damp they can cause an entire jar of dried mushrooms to spoil, so be certain the mushrooms are dry. 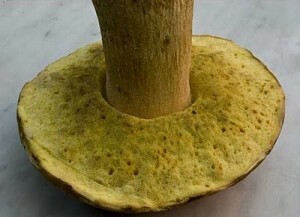 It takes at least six months for dried boletes to develop their full flavor. The longer you store them, the better they taste. This post is included in Weekend Herb Blogging compiled by Marija from Palachinka. I love your blog and recipes! Ah, I am salivating over that shroom ragu. Must make it soon. i am savouring the pasta sauce from the screen – wonderful finds! What an incredible post. I have learned so much today. I have to fight traffic in Manhattan to get to my mushroom forest in my neighborhood supermarket. Wow, i dream of collecting wild mushrooms! The photographs are just fabulous, i particularly like the look of the Wild Mushroom Pasta Sauce. I envy you for the amount of mushrooms you already gathered! We found only a few hedgehogs and boletus in SE and hope for more after rain. Thank you for the information and the wonderful recipes — you have made this excellent mushroom season that much better! As for being jealous of our weather, Maria, as of today we've had 30 consecutive rainy days (cold and rainy at that), beating the previous record of 27 days set in 1951. And it hasn't stopped yet. They're predicting rain for the forseeable future. I'm not complaining, but you being jealous is going just a wee bit too far (especially as I look at pictures of blue skies and beautiful sandy beaches near you in Crete). Good luck in SE, roaches. Wish I were finding hedgehogs. They might be my personal favorite of the wild mushrooms. Steve and Edie, so glad to find out we're not the only pickers around. Margot, Thanks, I didn't know and, yes, they are stealing lots of my content. I've started the legal process to shut them down. I very much appreciate you alerting me! This is a great post! I'd love to go mushroom foraging with you, and then eat some of your mushroom ragu. Good to see my neighbors next door also take full advantage of the incredible diversity of the fungi provided in the north. Keep up the great work! WOW! I can't but be impressed by this post. 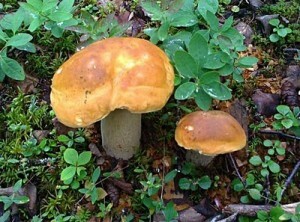 And so jealous….I guess living in Alaska has its perks and wild mushrooms are definitely one of them! I'd love to learn mushroom foraging, although the mountains around Athens are I think too dry for them, plus they keep burning them down. I have, however bookmarked your recipes just in case a good bunch of wild mushrooms comes my way! Hi! beautiful pics! 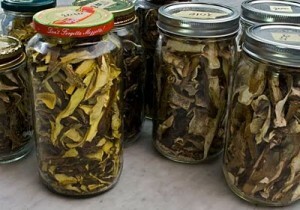 By the by, do you know of any meet-ups, or clubs for foraging in Anchorage? I'm curious as to good spots that aren't closely guarded secrets, as well as other folks with a mycological bent. Saw some incredible boletes near Hope over the weekend, must've been three pounds, but they were too far gone to bring home. Plus, I lost my copy of All the Rain Promises, so was a little leery of a positive ID. Beautiful pictures! Beautiful mushrooms. I love mushrooms and have gathered different varieties here in West Virginia. We have several types of boletes, but I'm never sure enough of them to try any. I wish I knew the edible ones! Your recipes look awesome! Great article. You are so right about a mushroom guide for Alaska. My mother Phyllis Kempton, was working on such a book but was unable to finish when cancer took her. She had devoted most of her adult life to the scientific study of AK Fungi. Her herbarium went to University of Michigan where she and her associate Virginia Wells had collaborated with Dr. Alex Smith. The field guides he published were the basis for much of their pioneering work in AK. TK, so nice to hear from you as your mother was the person who taught me most of what I know about wild mushrooms. I had heard of the work she and Virginia Wells had been doing. One day in the late 80s/early 90s, I called her up and asked if she'd be willing to let me tag along with her when she went mushrooming. Thus started a series of wonderful expeditions. Your mom would call and say she was leaving in an hour and did I want to come. I always did, no matter what I had to cancel to go along. The expeditions stopped when I moved to Juneau for work. Your mom's knowledge of Alaska mushrooms was unmatched, and it was Alaska's true loss that she was unable to complete her book. The funny thing was, my interest was always in edible mushrooms and while your mom clearly knew which mushrooms were and weren't edible, she often told me she had no interest whatsoever in eating them. Your mom was a wonderful woman and very willing to share her knowledge. I was so sad when she died and often think of her when I'm out foraging. Mwalla, you should go to the Girdwood Fungus Fair this weekend. A fantastic post! Thanks for all the work you put into it. I almost would want to move to Alaska. Not quite. We're having sort of drought conditions here where the good mushrooms grow. Mmm, I haven't had wild mushrooms much since I lived in Kasilof – a long time ago! That ragu looks particularly scrumptious. I wanted to ask – I happened across your blog in a Google-stab-in-the-dark – can you tell me where you're buying bulgur in Anchorage. I haven't had a chance to scour the town yet, but after not finding it at New Sagaya I've been wondering if I shouldn't just go for mail order! CP, Sagaya does have bulgur but it's in sort of an out-of-the-way place with a bunch of other dried products in bags of the same brand, named Zergut. If you walk down the aisles from the front of the store towards the back, it's on the left hand side on the very bottom shelf at the end of an aisle near the meat department. W.O.W. Those are truly incredible! What a great foraging adventure you two had and a lovely bounty. As always your recipes are intriguing… I love the pairing of clams with mushrooms, not a combo I have thought of but which sounds (and looks) divine. Mushroom hunting is a reliably good soul-soothing activity, Manju, and right up your alley. As for clams and mushrooms, as the old saying goes, everything goes better with bacon. Hi, I live in Nome,Alaska. Being from Oregon, we are mushroom hunters . Do you know of any that grow on the tundra around the Nome, Council, or Teller areas ? Hi Ruth, There are many mushrooms that grow on the tundra in your area, including highly prized Leccinums and Boletes. The best resource for your region is http://www.uaf.edu/files/rap/Yamin-Pasternak%20dissertation%202007.pdf – a doctoral dissertation written about mushrooms in the Russian tundra regions that are quite similar to where you live. I’m going to be visiting Anchorage and the Kenai area in September 2012. Do you know of any guides I can hire to take me mushroom hunting? I know mushroom hunters don’t like sharing their secret spots but I’ll only be in town a few days and I won’t have a freezer to store anything so I can’t possible harvest that much. I’ve always wanted to forage for mushrooms but I’m not in a good area of the country for it. I live in Austin, Texas. We don’t get a lot of rain or forest fires. I do get to forage for figs, persimmons, pomegranates and wild greens in my neighborhood. Being a foodie, I’d love to find someone to take me mushroom hunting and berry picking then let me use a kitchen to dry the mushrooms and make some jam to send home. Of course, I’d have to make some wild mushroom pasta and berry pie to fuel a night of canning as well! I haven’t booked my accommodations yet but I may look for a B&B with kitchen access so I can cook for myself. If you could point me in the right direction, I’d really appreciate it. Hi Tania, Sorry for the delay in answering this. I’ve been racking my brain for ideas, but I don’t know of any guides. Also by September in many years the mushrooms and most berries are over, so I wouldn’t want to guarantee that you’d be able to find anything then. Feel free to check in with me when you come to Anchorage and I can give you a status check on the foraging opportunities. Hi Laurie, Finally getting some rain in Anchorage. I was wondering if you have had any luck finding any morels this year, I have went out a couple times to some promising locations but it appears to dry…until today :). And since you are much more knowledgable than I, I thought maybe you would have a suggestions as to when they might start popping. Historically I have found them in early june, and they appeared a little aged…I was trying to get on it early this year, and obviously as dry as it has been nothin much seems to be popping yet. Thanks for any info and insight. Hi Jeff, This year is tricky. There hasn’t been rain, but there have been saturated soils from high ground water associated with our record snow. I’ve been worried about mycelium rot, maybe unnecessarily, but I figure if I put in my time worrying, the bad thing (rot) is less likely to happen. As I’m sure you know, in Alaska morels grow in disturbed areas, particularly those where there has been a recent fire. In my experience, morels don’t necessarily appear one year where they did last, so it is hard to predict where they will appear (tho going to last summer’s fire locations is generally a good bet). I also find that Alaska morels aren’t very flavorful. As a result, I rarely go hunting for morels any longer, especially because in spring I am so busy harvesting and processing wild greens. Speaking of which, devil’s club shoots are ready today and maybe for a few more days, depending on where you are. They’re absolutely delicious! Planning your vacation around food sounds perfectly normal to me! The difficulty is in predicting exactly when wild edibles will be ready. You never know! We usually start getting good mushrooms in early August, but some years are later than others, so you can’t really count on it. This year we had the largest snowfall on record and resulting unusually high ground water in spring. These are the kinds of factors that influence mushroom fruiting, but it could go either way (earlier than normal or later than normal). Berries are the same, although a little more flexible because there are different kinds (cranberries, for example, follow blueberries. I wish I could be more precise, but you just never know! Kudos for your blog! Thanks for all the info. I’m from Humboldt County, California and have been mushroom hunting for the last 5 years. It is so fun and rewarding! I am currently staying in Two Rivers, Alaska, 30 minutes east of Fairbanks (My first time in Alaska). I’ll be here until the middle of August. I’ve noticed a few boletes growing in the woods around our cabin, but being unfamiliar with Alaskan fungi, I was wondering if there are any toxic boletes (Boletus sp. or Leccinum sp.) I should worry about in this area. Also do you know if and when my favorites like hedgehogs or chanterelles grow in this area? Thanks! Thanks Laurie for all these recipes and advice! Yesterday we found our first mushrooms of the “fall” season down by a low-elevation creek – honey mushrooms, nice puff balls, and meadow mushrooms. Also we found this one — I’ve uploaded a picture. 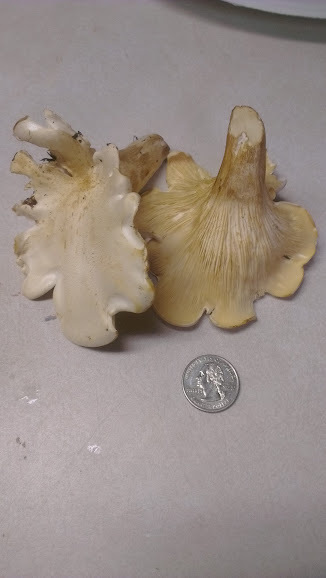 I was thinking it was a white chanterelle, but your blog says that they are not in Anchorage. It has false gills like a chanterelle, and is mild tasting. What do you think it is? Hey Laurie, Thank again for the info you sent. It was all very helpful. The king boletes are popping up everywhere this week in the Chena River area. Shroomies galore! David, I’m jealous! We’ve been going out every day and finding one here or another one there, but no real crop yet. I’m very impatient! what is the best book to buy to identify edible mushrooms in Alaska? In any case, as I mentioned in the story, the books I like best are David Arora’s Mushrooms Demystified and All That the Rain Promises and More: A Hip Pocket Guide to Western Mushrooms. I also like The New Savory Wild Mushroom by Margaret McKenny and Daniel E. Stuntz. Alaska’s Mushrooms: A Practical Guide by Harriette Parker is good, but very limited in scope. Although I’ve found B. edulis in No. California, I’ve never found them in southcentral Alaska. However, recently I had found some (quite a few actually) what I think now are L. subgalbripes and was wondering what their edibility factor is, you have a photo of them here, but was wondering what you think, are they worth picking/eating? Love all the details of this blog. 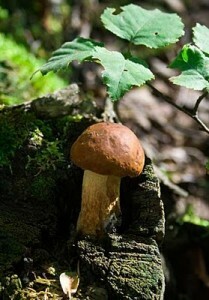 Are you willing to share some details of the environment we need to look for to find Boletus? Hi Steph!! They are found mostly in and on the edges of forest land. Good luck! Just discovered your posts while researching mushrooms of Alaska. Love it! You cook like I do : ). My family moved to Anchorage a year ago from Houston and I was having trouble adjusting to the very different climate, lack of ingredients I love to cook with, etc. but it all changed FrIday Morning on a trail run in the rain when I was whining in my head about running in the cold rain when I saw it. 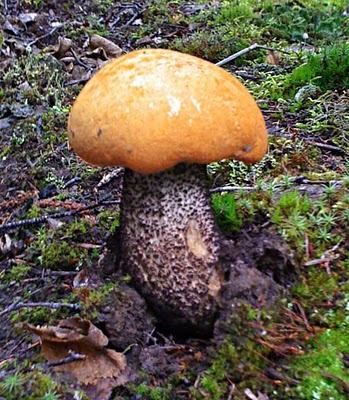 A giant porcini mushroom! We spent a couple weeks in Italy in July and ate them daily. I had no idea they grew here. We just got back yesterday from Kenai where it was Porcini Land! Again on a trail run on the rain, I was excited this time. They were everywhere. Brought back eight pounds and left tons behind. Sautéed them up with some wine and garlic, warm goat cheese, and served them over some young dandelion greens my 12 yr old son picked for me. I am now in love with Alaska! Now to learn how to identify other edible mushrooms here…..in search of chanterelles! Sydney, welcome to Alaska!!! Don’t really have chanterelles here, sorry to say. In spring, we do have lots of tasty edible plants though. Thanks for writing! We found several mushrooms, but very difficult to identify only with photos from books, as they always look different than what you actually find….How can I share some photos with you of mushrooms, to help me identify them? We were near Skilak Lake yesterday and found a plentiful mushroom growing from the ground, white-ish, but not white/white. It had an irregular shaped top – not domed nor round, and a velvety underside. It was not gilled. It had a light, delicious lemony fragrance. My husband who knows a little about mushrooms, tried to identify it after coming home, but was not successful. Do you have any suggestions what it may sound like? We are excited to learn about mushroom collecting! Thanks for doing your blog. You mentioned lack of the “perfect” book for Alaska – are you working on one?